1941 FL finished April 2004. 1941 FL finished April 2004, This has a 1949 mufler cover an original set of flying bird rocker covers, air cleaner, and derby cover, all old original parts. Also original top fender trim and eagle tips. 1941 FL finished April 2004, these are my favorite motorcycles, the knuckle pistons don't get sticky. The style is so handsome, H-D are still modeling their new bikes after it. 1941 UL, My second restoration, 25 years ago. It began my affection to that style of motorcycle and trim. I also stuck the piston twice. Me and my 1941 UL as seen a hundred years ago. 1941 UL, With sidecar and wife attached. Taken at Sturburge Mass September 1989. 1955 FLH Atomic Blue photo taken at the Perkiomen meet 1992. 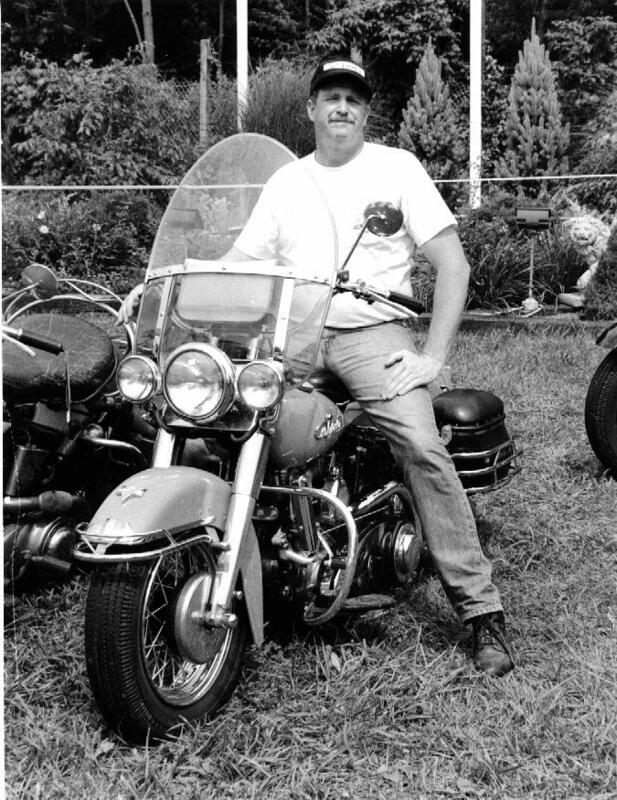 This picture taken at the Hamilton Rod and Gun Club Sturburge Mass, Fall Yankee Chapter Meet, September, 1990. In the Background are Frank Adams (bach tward camera) Fred Hurch (talking to Frank) and two other Members, I cannot identify. Bob Frink Photo. Taken at the Yankee National Meet, Acton Maine June 24, 1990, I was Director. Left to Right, Harley, Ian, Me, K-9, Lindsay, and May. Another of Bob Frinks marvelous photos. 1968 Electraglide Hi-Fi Blue Bought in Florida 1974 for $1200. I am still happy with that price. It looked a lot worse. This is my first complete rebuild. Ians first trip to the Cabot Trail, shown here with Kenny Bowie (yes, related to Jim Bowie) Bernie Mcdonald (Boston Bernie) and myself taken at St. Andrews Nova Scotia around 1996. 1994, Harleys first trip on the Cabot trail.